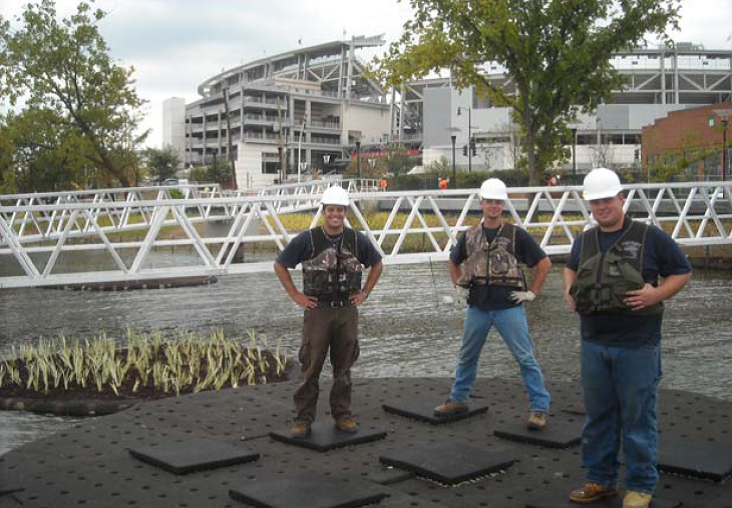 With everyday that passes, the true benefit of Floating Treatment Wetlands technology becomes more and more apparent to us here at Patriot LWM. Besides its obvious visual benefits created by the islands ability to instantly create flourishing habitat above and below the water, the true potential of the islands can not be seen with the naked eye. The matrix design of recycled plastic material allow for an increased surface area on which nutrient processing biofilm-based microbes attach. From this floating base of operation, the microbes work to breakdown nutrients that pass by them in the water. Intuitively we can only assume that the more water the Floating Treatment Wetland matrix and the associated microbes come in contact with, the higher its nutrient processing potential. The following study by Floating Island International takes a unique look at this statement and some interesting ways to get water in need of treatment to the microbes in need of nutrients. Wetlands have long been known as natures purifiers, but as the worldwide acreage of wetlands continues to fall coupled with increased human-caused nutrient loading, many water bodies around the world have experienced cases of hyper-eutrophication. Simply stated Eutrophication is a scientific term describing the overfertilization of lakes with nutrients and the changes that occur as a result. Negative environmental effects include anoxia, or loss of oxygen in the water with severe reductions in fish and other animal populations. In fresh water, partly as a result of normal seasonal stratification, nutrient loading can deplete oxygen levels within the livable temperature zone for cold‐water fish species. In April 2009, a 1250‐square‐foot Leviathan system, incorporating floating stream beds and grid‐ powered water circulation was installed in the lake. This system circulates up to 2000 gpm through the stream channels within the island. The basic concept takes water from all levels of the lake which would previouslynot come in contact with the wetlands and circulates them through the stream channels of Floating Treatment matrix where microbes can process the nutrients. The method allows you to basically super-charge the nutrient processing capability of your Floating Treatment Wetland and turn a once stagnant waterbody into a highly productive member of your land management program. After 17 months of operation, water clarity had improved from a low of 14 inches of visibility to as much as 131 inches. Simultaneously, the water temperature gradient was reduced, creating a larger zone of “livable” water for fish. Two age classes of Yellowstone cutthroat trout were introduced 13 and 14 months into the test. Through the summer of 2010, a favorable temperature/dissolved oxygen strata ranging from the water surface down to a depth of at least 12 feet was maintained as potential cutthroat habitat. One‐year‐old and two‐year‐old black crappies were also introduced two months into the test, and naturally‐occurring northern yellow perch were present in the lake when it was filled. All three species have flourished. Fish catch rates and growth rates are now being monitored at the lake. Initial data show that experienced fishermen can catch up to one perch per minute. Visual observations from diving and an underwater viewing station indicate that perch approaching or exceeding the Montana state record of 2 pounds 2 ounces now inhabit the lake. The research lake is relatively unique in that it supports fish accustomed to cold water (Yellowstone cutthroat trout), temperate water (perch) and warm water (crappies). Montana officials have made two unsuccessful attempts at sustaining cutthroat populations in an adjacent stretch of the Yellowstone River, which is located a half‐mile away from the research lake. Further additions to the square footage of the original design for 2010 have further increased the “livable area” for fish to a depth of more than 20 feet at certain times of the year. This further maximizes the useable production space for the lakes fishery habitat. As data continues to be collected and more projects initiated, the future is very bright for the use of Floating Treatment Wetlands to restore the health of Americas water bodies. Patriot LWM is currently working with Bluewing Environmental to solidify 2 Leviathan test projects in Maryland. Stay tuned for more exciting news. For more details on the above mentioned study CLICK HERE.